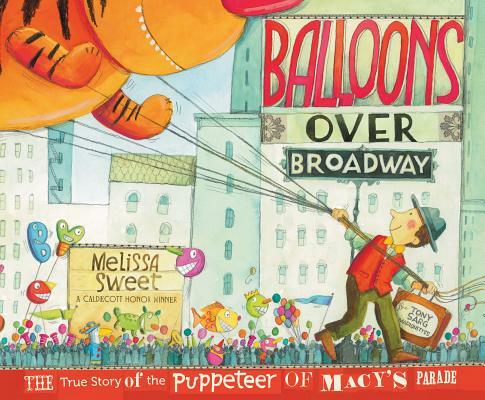 Balloons Over Broadway: The True Story of the Puppeteer of Macy's Parade by Melissa Sweet. Grades 1-5. October 2011, Houghton Mifflin. Unpaged. Review copy provided by my local library. Happy Halloween! Are you ready for a Thanksgiving book?! Since he was a little boy in England, Tony Sarg loved figuring out how to make things move. When he was six years old, he rigged pulleys so that he could open the chicken coop doors from the comfort of his warm bed, prompting his impressed father to excuse him from chores. As he grew older, Tony developed a love for marionettes and began to create them in London and then show them on Broadway after he moved to New York City. He first worked for Macy's by designing moving figures for their holiday windows and when Macy's wanted to add puppets to their Thanksgiving parade, they knew who to call. The first Macy's Thanksgiving Day Parade was held in 1924 to honor the many immigrants who worked for the store and their cultural celebrations. Tony Sarg, an immigrant himself, created the iconic floating balloon puppets, which debuted in 1928 and have been in every Macy's parade since (except for 2 years during WWII when rubber and helium were needed for the war effort). In accessible prose, with just the right level of detail, Melissa Sweet tells Tony Sarg's story. This story is destined to become a Thanksgiving favorite. This time of year, we're inundated with tales of turkeys and giving thanks. There's nothing wrong with either of those topics, of course, but Balloons Over Broadway gives us a refreshing change of pace with a look at another Thanksgiving tradition. The fact that the parade was started to honor immigrants ties in nicely to the bigger themes of the holiday. I love the art in this book and it's definitely one of my Caldecott picks this year. Melissa Sweet, Caldecott honor winner for A River of Words*, uses colorful watercolor paintings and mixed media collage to bring this story to life. She includes whimsical details in the pictures that kids will love to pick out (and I'm sure Tony Sarg would have appreciated). I'm especially impressed with the toys she created for the mixed media spreads, some of which are based on toys that Sarg himself created. Even the endpapers contain information and details that add to the story - the back endpapers include an original advertisement for the 1933 Macy's parade. As all children's nonfiction should, the book includes an author's note and a bibliography and source notes. A librarian would be hard-pressed to ask for more. Don't miss this book! 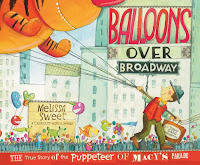 Balloons Over Broadway is on shelves now! Happy Nonfiction Monday! Check out this week's roundup over at Jean Little Library.